In the second part of the series, we will dive straight into the variety of SEO plugins that WordPress have to offer. Now-a-days, blogging is not just about writing content as you also need to understand the vast opportunity of the search engine market and grab the target audience. There are a wide variety of plugins which can help you to make your WordPress site more and more search-engine friendly and improve the overall SEO of your site. So, in this part of the series we will focus on all the essential SEO plugins that you may need for your WordPress site. These plugins can help you a lot in boosting the search engine rankings by improving the on-site SEO of your WordPress blog. You can make your website more search-engine friendly and can track your ranking progress too. This plugin have improved a lot over the years, and what it offers now is extremely desirable for almost all beginners and professional level SEO experts. 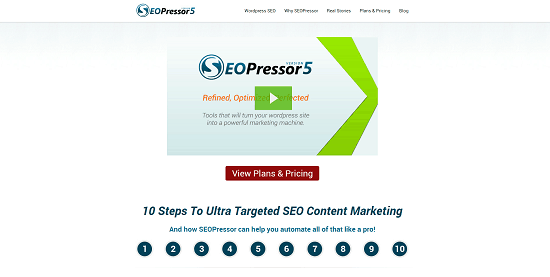 A very simple and easy to use SEO plugin to take care of your entire sites on-page SEO. It is a must have for all the beginners. It is a very powerful yet user-friendly plugin which can help you in writing your content based on profitable keywords and also optimize the content to make it rank better in the SERPs. It is one of the most complete and advanced SEO plugins, which can give you full control of almost every single aspect of your WordPress sites SEO. This plugin does an important job of creating a clean sitemap of your entire site so that the search engines can navigate and index your site with ease. It is a powerful plugin which can automatically interlink your posts based on its intelligent algorithms giving you a taste of better search engine rankings. If you need to create unique and resourceful articles, then this plugin can give you the expert assistance you need with its amazing features and easy-to-use user interface. SEO is not just about optimizing your content as you need to give proper marketing care to your images too and this plugin is just what you want as it can make your job super-easy. This plugin can help you in keeping track of the keyword rankings through its intuitive and easy-to-read graph. This simple plugin does a great job by letting you preserve the URL structure of your WordPress site by helping you to easily redirect from one page to the other. SEO is turning its importance more and more towards social influence, and this plugin can help you harness the true social power of your blog by adding, Facebook Open Graph, Twitter Social Cards, Google Rich Snippets, etc. We have come to an end of this dedicated “SEO” episode of the series and I am sure that the plugins mentioned here will help you to improve the search engine rankings of your blog and will also help you drive more and more laser-targeted organic traffic. In the next part of the series, we will continue with a very important aspect of WordPress, that is – Security and Spam Prevention. So, stay tuned for the next part of the series. This entry was posted in WordPress and tagged Marketing Plugins, plugins, SEO, wordpress on May 9, 2014 by Aritra Roy.